Everyone fortunate enough to share their life with dogs know that each, and every one of them is special; however, some of us share our lives with dogs who are not only special, but also specially-abled. Saturday, May 3rd was National Specially-abled Pets Day – recently renamed from National Disabled Pets Day to better describe these animals’ incredible spirits. I am the proud parent of a specially-abled dog, and happy to share our story. 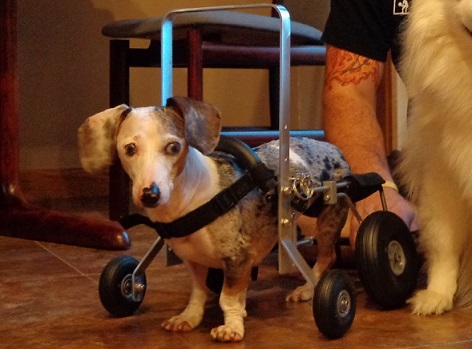 Our 10 ½ year old mini-dachshund, Ava, has been specially-abled since she was a little over 3 years of age when she was diagnosed with Intervertebral Disk Disease. Ava faced her challenges head on and adapted very well to her physical circumstances. For roughly 6 years she continued to live life according to her new normal; but as she faced normal challenges associated with aging coupled with her situation, she began to weaken and we knew she needed more help to be independent. We have made reasonable adjustments over the years as needed and will continue to do so for as long as we are fortunate enough that Ava needs us. So, last year we equipped her with a wheelchair. We quickly went from 2 wheels to 4 and the changes in her abilities have been amazing! She has regained her confidence and wheels around like she’s been doing it her entire life. Her self-sufficiency is remarkable. Specially-abled pets come in many varieties which may be brought on by illness, injury, or genetics. They may be blind, deaf, missing a limb, or in a wheelchair, and that’s just to name a few! Regardless of your dog’s age at the onset of their challenge, or whether it is permanent or temporary, they can be shining examples of an energetic, happy, and engaging pet. Anyone who has interacted with specially-abled dogs has witnessed the amazing resilience and strength that pours out of these creatures. However, there can be an adjustment period for the dog and their family, bringing on feelings of frustration, sadness, and even depression. But, as the dog adapts to their new normal, these feelings are replaced by hope, excitement, and joy. Dogs are incredibly sensitive and in-tune with us, so it is important to provide them with strength and confidence by believing in them and setting them up for success. Following are a few suggestions that may help you and the specially-abled pets in your life. Don’t baby them. 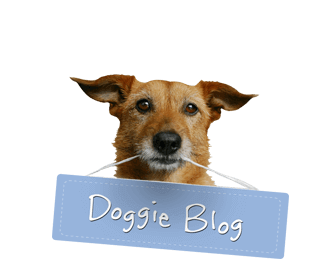 Dogs can overcome many physical and emotional hurdles, but only if we allow them to. It can be heartbreaking to watch your dog struggle with daily activities, and there are many ways you can help them, including medication, therapy, training, and equipment. The hardest thing to do is stepping back and letting go. It is only by allowing them to try and fail that we will enable them to try again and succeed. Understand their specialty and make reasonable adjustments. This may seem to contradict the previous point, but they actually go hand-in-hand with one another. By understanding how their challenge affects them, we are able to make reasonable adjustments to their life, thereby, setting them up to do things on their own and to find a new sense of independence. Let people know your dog is specially-abled. Even if a specialty is visible, people may not think about all the different ways it can affect a dog. Life with your dog’s challenges may become second nature to your family, but people inexperienced with your dog’s situation will not know how to adjust their interactions if you don’t tell them. It is also beneficial for people unfamiliar with specially-abled pets to learn about the quality of life they actually experience. Many disabilities are not as disabling as people might expect. Take care of yourself. Parents are often so focused on helping their dog, they don’t realize when they need someone to help them. Your dog is leaning on you for support, but who is supporting you? Don’t be afraid to ask your family and friends for support – mental, emotional, or physical. Reach out to trusted pet businesses in your area; they may know people in a similar situation. Aside from people already in your life, there are many resources available to offer support, information, and tips. These resources include, but are not limited to: http://www.speciallyabledpets.com/about.htm, http://www.blinddogs.net/, http://www.deafdogs.org/, and http://eddieswheels.com/. Does your family include a specially-abled pet? Please leave comments and tips below.